We are saddened to inform the passing away of Bhicoo Manekshaw. She was one of the best known names in the world of gastronomical delights. 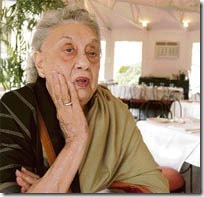 Her cookbooks on Parsi cooking are some of the best around. Our thoughts and prayers to the entire Manekshaw family at this time. R.I.P Bhicoo and you will live on through your recipes and memories.